FareShare UK is a tried and tested solution, with over 20 years experience of working with the food industry. 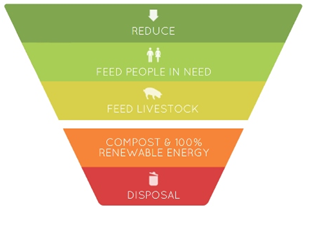 We follow the principles of the food waste pyramid, which is shown in the image above. When surplus food arises, it should first be directed to feed people in need before being considered for livestock feed, compost and renewable energy and lastly landfill disposal, which is hugely damaging to the environment. If you have quality surplus food and are looking for the most ethical solution, contact us today. If you’re a food company, we can help you identify opportunities to capture food surpluses within your supply chain and redistribute it for consumption. FareShare redistributes all sorts of surplus food, including meat, dairy, fruit, vegetables and ready meals, along with tinned and packet foods such as tuna, rice and coffee. Any food accepted by FareShare must comply with food safety legislation, be within its use by and best before dates and be packaged appropriately. Surpluses may occur for a variety of reasons including overstocks, production trials, retailer rejections, seasonal stocks, damages or deleted lines. Please note: We cannot accept unpackaged prepared food, or food in highly damaged packaging. Read our full guidelines here. Although the large majority of the food we redistribute comes from food industry surplus, we are always grateful to take donations of non-perishable, in-date products from individuals or groups. Food can be dropped off at our warehouse in Moulsecoomb – Units 3-4 Fairway Business Centre, Westergate Road, Brighton, BN2 4JZ. We also have several food collection points in the area where you can drop food items. A nice way to get a team involved in supporting the local community is by hosting a food collection point in your school, group or workplace, where people can drop off non-perishable, in-date items over a certain period of time. Get in touch for more details. If you are considering supporting us in this way, it’s worth noting that it makes even more of a difference when food collections and financial collections are combined, so that we can keep our vans on the road and pay for our warehouse space. We keep our costs as low as possible. 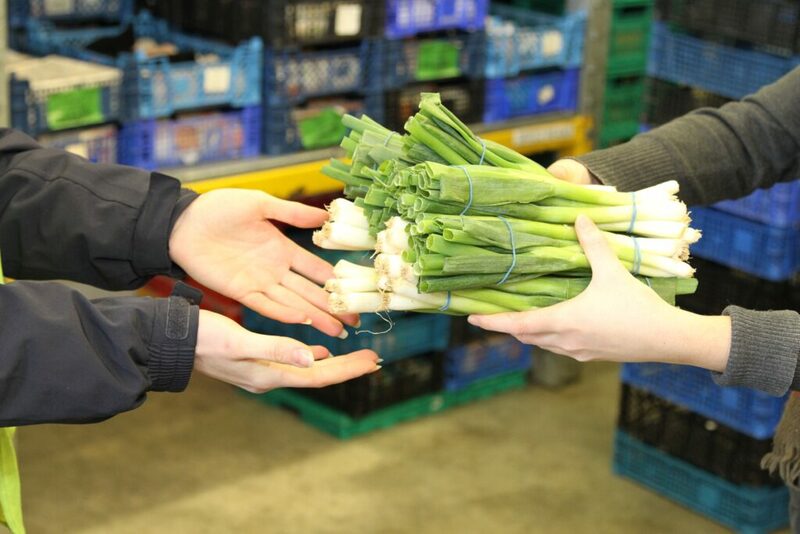 £1 enables us to distribute £6 worth of food, but without financial support our service could not exist. If you would like to request a collection tin or find out more about fundraising for us, click here. 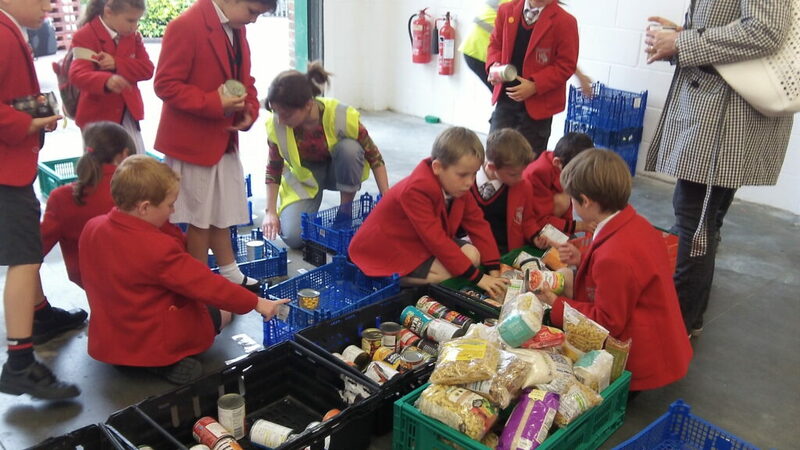 Get your local school involved in a food collection for Harvest Festival this autumn. Talk to us about how we can support your school with resources and activities. 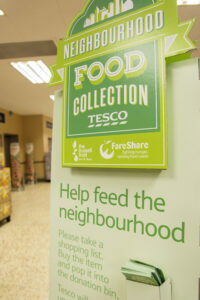 Every year, FareShare takes part in a large-scale food collection in Tesco stores across the country. Over three days, Tesco customers are invited to purchase an extra non-perishable food item with their shopping to donate. At the end of the event the food is totalled up, topped up by a 20% financial donation from Tesco and distributed to each of the FareShare Regional Centres and Trussell Trust food banks. The food collected nationally in the December 2016 collection was enough for an incredible 2.8 million meals! Get in touch if you would like to be added to the event mailing list to be the first to know about volunteering positions across the Sussex stores. 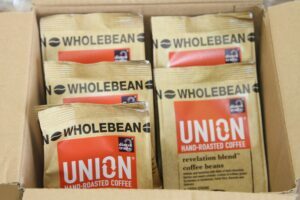 If you are a national company and are interested in getting involved visit our FareShare UK website.